I am endlessly baffled by modern society. We have reality TV stars whose only talent is to shock and annoy, and yet inexplicably have millions of adoring fans. We also have sports superstars who get paid tens of millions of dollars to play a game they love, and yet they still get elevated to God-like status. 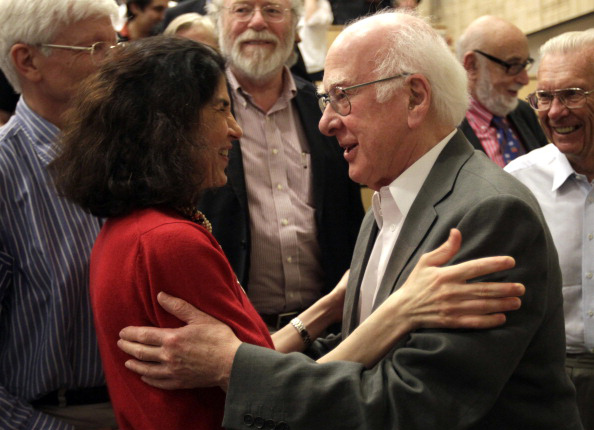 And then there’s Professor Peter Higgs, arguably the biggest science superstar of recent years. So, we now have evidence for the existence of the Higgs boson — or a Higgs boson — to a high degree of statistical certainty, ultimately providing observational evidence for a critical piece of the Standard Model. This story began half a century ago with Prof. Higgs’ theoretical team, and it culminated on July 4, 2012, when results from a $10 billion particle accelerator were announced. Later, Higgs’s friend and colleague Alan Walker recounted the low-key celebration they held after learning of the breakthrough, one of the most important scientific discoveries of recent years. Walker said he and Higgs were flying home from CERN in Geneva this week on budget airline easyJet when he offered Higgs a glass of Prosecco sparkling wine so they could toast the discovery. Higgs replied: “‘I’d rather have a beer’ and popped a can of London Pride,” Walker said. In a world where “celebrities” are hailed as superhuman, to hear that potential Nobel Prize candidate Peter Higgs took a budget airline home, after history had been made, typifies the humble nature of a great scientist and puts the world of celebrity to shame. Money and fame matters little to the people who are unraveling the fabric of the Universe. On a different (yet related) note, Motherboard interviewed people on the streets of Brooklyn and asked them if they knew what the Higgs boson is. Most had never heard of it, let alone understood it (which, let’s face it, isn’t a surprise — many science communicators still have problems explaining the Higgs mechanism). But I wonder if the same group of people were asked if they knew what a “Snookie” was; I’m guessing they’d have no problem answering. People may not read the news, but they sure have an innate knowledge of who’s in the gossip columns. Who Cares if Ashton Kutcher is Preparing for Armageddon? I’ve noticed a rather crazy uptick in the number of anti-science diatribes and wet doomsday theories in recent months. Most are due to questionable reports written on quasi-news websites (as debunked in “2012 Alien Invasion? Um, No.”), and others are down to the trolls who surf the web dropping comments under otherwise benign science articles. Could it be that Fakemageddon is a year away? Or has the use of computers been granted in kindergarten? Could be both. Although I joke about the misguided individuals inventing tales of doom to sell books, there is a rather serious undercurrent to my 2012 ramblings. People genuinely worry about this stuff. Sure, I’m totally numb to all this 2012 tomfoolery — it’s all crap, honest — but I’m still receiving messages from readers who are convinced something bad is going to happen on Dec. 21, 2012. So where does that leave us? What can we do to divert the nonsense and bring some real science to the table? For one thing, I’m going to keep writing about the crackpots perpetrating these silly myths through 2011 and beyond. Although fellow debunkers and myself have been under attack recently for even mentioning the 2012 thing — something about a dead horse and a good beating — it’s important to inject common sense into the Internet whenever nonsense appears. If these doomsday theories go unchecked, for some, science and pseudoscience may become confused. This is where the “Truth Squad” (as MSNBC science editor and Cosmic Log space maestro Alan Boyle has dubbed us) comes in, and I’m pretty sure all space science bloggers will be on the lookout for the doomsayers’ tall stories. So, in conclusion, if you read something with an eerie 2012 flavor on the internet, be sure to check out my handy dandy “How Do You Spot Science Abuse in the Social Media Soup?” cheat sheet. Also, don’t pay attention to celebrities who are obviously getting a little hyped up on the doomsday juice. No, I don’t think Ashton Kutcher really has anything to worry about in the near future, but if Armageddon works as a workout motivator… well, good for him (besides, I think he might have been taken out of context, so also look out for Huffington Post articles that try to make mountains out of molehills). PS. I hope to make Astroengine.com a little more productive through 2011. But in case you’re wondering what I’m up to, be sure to pop over to Discovery News, I’m always there. Author Ian O'NeillPosted on January 3, 2011 Categories 2012, Featured Articles, Humour, Off the Record, Opinion, Pseudo-scienceTags 2012, Armageddon, Ashton Kutcher, Doomsday10 Comments on Who Cares if Ashton Kutcher is Preparing for Armageddon? Although I’ve been neck-deep in Ares I-X launch news today, I’ve had some time to see what else has been going on in the Universe. I really hope I’ll find the time to get to this stack of blog post ideas over the weekend, one of them is a particular peach. I think that one of the hardest things NASA has to do is to communicate their incredible science to the general public — no one said outreach was easy. Every day I am challenged with this issue on Discovery News. On the one hand I want to talk about the quantum effects of Hawking Radiation at the event horizon of a black hole, but on the other, I have to realize that most of my audience didn’t take Advanced Quantum Mechanics at school. Realizing how to approach an audience with science is a bit like approaching a crème brûlée with a blowtorch; you have to do it slowly, with enough distance between the caramelizing sugar (audience) and the flame (science). You get too close and the mix gets burned (confused), get too far away and the mix is undercooked (bored). This by no means is equivalent to “dumbing down,” it’s simply a method to find analogies and examples that can connect the mind-bending science with a tangible reality (like comparing the curvature of space-time with the curvature of a rubber sheet when a heavy ball is placed on top of it). If you start over-simplifying the science, you end up sounding like a tool and your audience thinks you’re lame/boring/condescending. If analogies and examples aren’t forthcoming, try humour. One example of this is “5 Frightening (But True) Space Stories,” a guest blog post for Space Disco Robert Lamb posted today. Robert is an expert at blending science and humour. So much so, this blog post teaches some spaceflight history without you even realizing it. Running the risk of sounding a little long in the tooth, Keith is obviously a little riled about the standard of writing on this particular post. At first, I was mildly amused, but the more I looked at it, the more I realized NASA’s outreach style might be flawed. Using text-speak to convey his work presenting for NASA makes Alonso sound limited (which I’m sure he’s not, although I haven’t seen him in action, so I might be wrong), but worst of all it knocks the credibility of NASA outreach. This might be one form of communication, but there must be some kind of editorial control? Are there standards? Granted, I think the content produced by NASA online is second to none, which is probably why NASA 360 is standing out like a sore thumb. Also, this blog post is the personal angle written by an enthusiastic young guy in a conversational, loose tone who probably has a lot of fans. Perhaps I’m just old fashioned in agreeing with Keith, but “outreach” doesn’t mean NASA should be publishing blogs like this to try to appeal to a younger/trendy audience. As sad as it may be, if the younger generation isn’t interested in NASA, I doubt a presenter saying “hai” all the time is going to change that. What do you think? Am I being picky? Is this just a symptom of what we can expect from blogs in the future? Back in 2006, I remember sitting in my local UK Job Centre finding out how I could claim for unemployment benefits. I can see it now, the moment I explained to my liaison officer that I had been looking for work but received little interest. She looked at me and said, candidly, “Have you thought about not mentioning you have a PhD? It might help.” She smiled. What? I now need to hide my qualifications if I want to get a job? Isn’t that a little counter-intuitive? Actually, as it turned out, she was right. Many of the jobs I had applied for didn’t require a postdoc to do them; why would a company hire me when they can hire a younger postgrad with lower salary expectations? Up until that moment, I was still hopeful that I might be able to land an academic position; possibly back in my coronal physics roots, but funding was tight, and I hadn’t done enough networking during my PhD to find a position (I had been too busy scoping out the parties and free booze at the conference dinners). So there I was, with all the qualifications in the world with no career prospects and a liaison officer who deemed it necessary to advise me to forget the last four years of my academic career. It was a low point in my life, especially as only a few months earlier I had been enjoying one of the highest points in my life: graduating as a doctor in Solar Physics. Fortunately for me, I had another option. My girlfriend (now lovely wife) was living in the US, and although searching for a job in the UK was a priority for us (we were planning on living in the UK at the time), I knew I could try my luck in the US as well. So after a few months of searching, I cancelled my Job Centre subscription and moved to the other side of the Atlantic. I had just become a part of the UK’s “brain drain” statistic. I had qualifications, but I was in a weird grey area where companies thought I was over-qualified and funds were in short supply for me to return to academic research. A lot has happened since those uncertain postdoc times, and although I tried (and failed) to pick up my academic career in solar physics in the US (it turns out that even the sunny state of California suffers from a lack of solar physics funding), the job climate was different. Suddenly, having a PhD was a good thing and the world was my oyster again. To cut a long story short, I’m happily married, we own five rabbits (don’t ask), we live just north or Los Angeles and I have a dream job with Discovery Channel, as a space producer for Discovery News. Although I’d like to think that if I was currently living in the UK, I might have landed an equivalent career, I somehow doubt I would be as happy as I am right now with how my academic qualifications helped me get to where I am today. Why am I bringing this up now? Having just read about Stephen Hawking stepping down as Lucasian professor of Mathematics at Cambridge University and the Guardian’s report about the risk of losing British thinkers overseas, I wonder if employment opportunities have improved since 2006. What’s most worrying is that there appears to be this emphasis on making money as quickly as possible, rather than pursuing academic subjects. However, in my experience, having a PhD doesn’t mean you can even land a job in industry, you might be over-qualified. A special thanks to Brian Cox, who tweeted the inspiration to this post. Where Are The Protests Now? In a discussion I seem to keep having these days when I mention that human spaceflight is actually a valuable endeavour for a nation, I’m usually met with a look of incongruity. Then the question: What has space exploration ever done for us? I used to get a little angry about this question (of course space exploration is important!) but in actuality, I have to explain the answer because it isn’t necessarily obvious. By pushing into space, a nation can enrich its technology, improve education, boost employment in skilled areas, thereby improving the economy and generally improving a nation’s standing in the world. That’s the eco-friendly version. There are other applications such as military prowess, strategic advantage and business potential. Unfortunately, doing bold things in space requires money, and to get money you need to convince the government that it’s worth spending money on. Last time I looked, there’s no Space Race 2 going on, so we can’t rely on politics to see the necessity of space flight. However, the US has invested billions of dollars in the exploration of space, and although NASA is a money-hungry entity, it produces results and has shaped the world as we know it. Granted, the US space agency was built on Cold War ideals and was hinged around the sole purpose of beating the Soviets to the Moon, but modern NASA is still relevant, if not more so. From space, and back to Earth with a bump. So, here we are, with a field-full of rabid protesters that have been whipped up into a frenzy by the media, special interest groups and political antagonizers. These geniuses see a nationalized healthcare system as a socialist agenda. Of course, this means communism is just down the garden path. Last time I looked, the UK wasn’t a communist state, and although the British National Health Service (NHS) isn’t perfect, it’s a damn sight better than the US health insurance insanity. The point I’m trying to make is that tens of thousands of people descended on the US capital to protest a healthcare bill that actually seems quite sensible. Unfortunately, this huge group believe this bill is actually a government conspiracy intended to dupe the public, bankrupt the country and control the nation. Now let’s wind back the clock to last year, when it was announced NASA would be shedding thousands of jobs when the space shuttle is retired. More recently, a task group was formed to discuss NASA’s options considering its budget isn’t going to grow any time soon — unfortunately, Bush’s “Vision for Space Exploration” can’t be done because the Constellation Program will cost too much. Now the Augustine Commission has set out some plans that may curtail NASA’s big projects, possibly even cancelling Constellation. To top all this off, there is a 5-year gap (minimum) between the shuttle being retired and Constellation taking over (if that even happens), that means there will be at least 5 years the US will have without a manned launch vehicle. Yes, the US has gone through this before (between the end of the Apollo Program in 1970 and the Shuttle Program in 1982), but this time we could lose access to the space station, a $100 billion project the US is heavily invested in. Fortunately, US companies are seeing business opportunities in space, so given enough funding, start-ups like SpaceX could start ferrying NASA astronauts into LEO sooner rather than later. There are also other nations involved in the space station and they can give us a lift into space. Unfortunately, apart from the Shuttle, there’s only one other spacecraft that’s human-rated in the world. That’s Soyuz. Soyuz is great, it’s a sturdy vehicle and it’s received little complaint from the astronauts and cosmonauts that have been ferried around in it (well, most of the time). The Russian space agency will basically be offering NASA taxi rides into space so the US can still use the International Space Station. The cost? $50 million per seat. Wow, what a bargain. The space shuttle costs the best part of a billion dollars to launch every time. Compare that with $50 million, it almost seems as if this 5-year gap is a good thing. It might save NASA some money! However, in the process of retiring the shuttle, skilled US jobs will be lost. Even the transition from the shuttle program to Constellation will cause a re-shuffle of NASA employees. Last year, Senator Bill Nelson pointed out that shedding jobs from the US space agency, only to rely on a Russian launch vehicle, will have the effect of generating jobs in Russia. This might seem like an over-exaggeration, but it may indirectly be the case. The added concern is that the $50 million value per Soyuz seat could increase. After all, US-Russia relations aren’t exactly toasty, the Russian space agency could set its own price for taxi rides to the space station. NASA money will be spent, not on advancing US spaceflight capabilities, but on another nation’s spaceflight capabilities. Sure, NASA and Roscosmos are co-operating now, but both are government-backed entities and that co-operation could turn south during the next East-West political upset. In summary, until US spaceflight companies develop human-rated space vehicles, or until the Constellation Project (or equivalent) is finished, the US will be wholly dependent on Russia for human spaceflight. NASA will be paying a premium rate for that privilege. So when I see thousands of individuals crowding on Capitol Hill, angrily protesting about the idiotic belief that the President of the USA is on the verge of creating a communist state, I think about NASA and the fact that the US space agency has been forced to pay for seats on board a spaceship maintained by an ex-communist state the US government is having problems with. Author Ian O'NeillPosted on September 29, 2009 Categories NASA, Off the Record, OpinionTags Manned, Manned spaceflight, NASA, Russia, Soyuz, Space Politics, Spaceflight2 Comments on Where Are The Protests Now?